BiForm Solid Composite decking boards are a convenient 4850mm long, giving a long run while simultaneously reducing waste and minimising thermal movement. Supported by well designed accessories, available in two useful sizes and six different colours, we have a board for all situations. Made from 60% waste timber fibre and 30% recycled HDPE plastic, Biform solid composite decking also has additives of colour, UV protectants and mould inhibiters. The materials are heated, pressurised and extruded into the shape of the decking. Biform Solid Composite Decking has no formaldehyde and no harmful timber treatments. Our decking boards are a convenient 4850mm long, giving a long run while simultaneously reducing waste and minimising thermal movement. 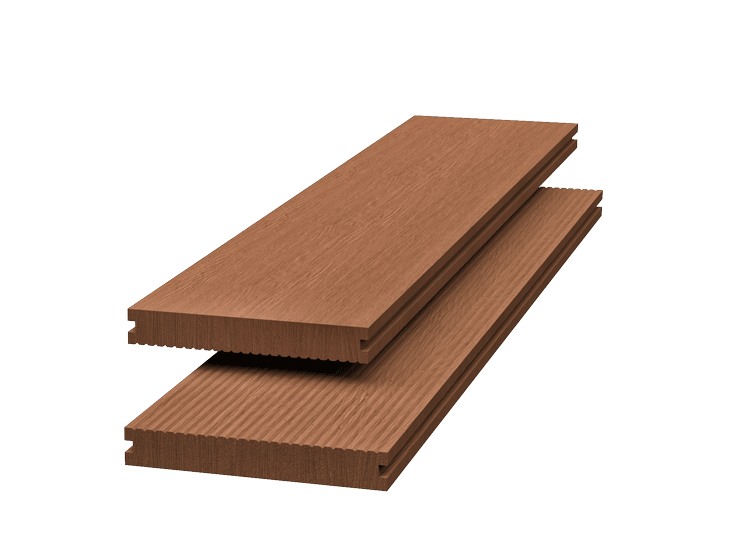 At only 30% plastic content, BiForm solid composite decking is specifically suited to our high UV conditions and is less likely to expand and contract compared to those composites with 50% plastic content. Supported by well designed accessories and available in two profiles and three colours, there is a wood plastic composite deck for everyone. Available in two useful sizes and four different colours, we have a board for all situations. Form 140 can be used in residential and commercial applications such as public viewing platforms, walkways, restaurants and seating. For use where joist spacings are set at maximum 450mm. Available in four colours. Form 130 can be used in all residential decking situations, and popular in commercial applications where restrictive height is an issue or minimal carbon footprint is required. Available in all four colours. A classy emulation of weathered off timber – without the warping or twisting. Replicates the warm gingery tones of Cedar. Similar to Camo Grey with brown toning.